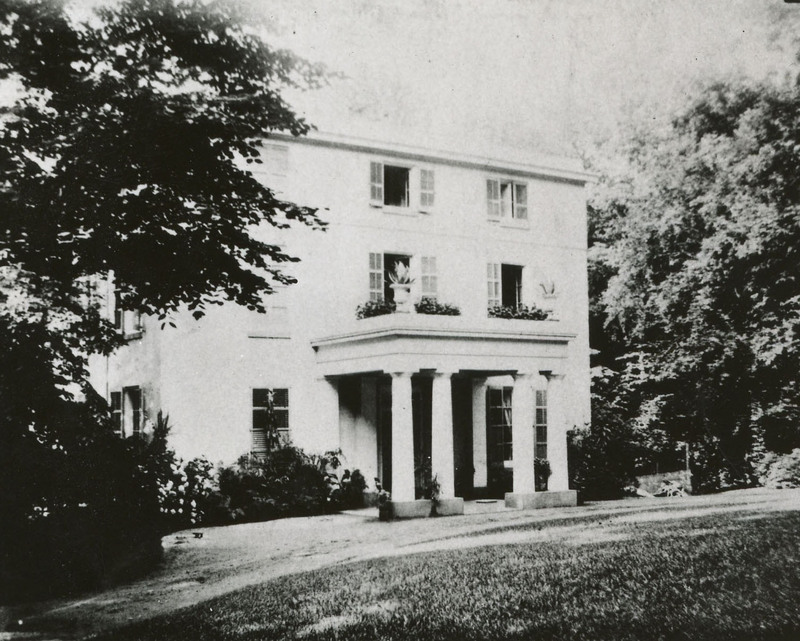 Winterthur, the childhood home of Henry Francis du Pont, has undergone many transformations in its rich history. The original 12-room, 3-story Greek revival mansion, built in 1839 by Jacques Antoine Bidermann and his wife Evelina du Pont, was only a fraction of what Winterthur would become. In 1902, du Pont’s father, Colonel Henry Algernon du Pont added a new façade and library wing to the existing structure. 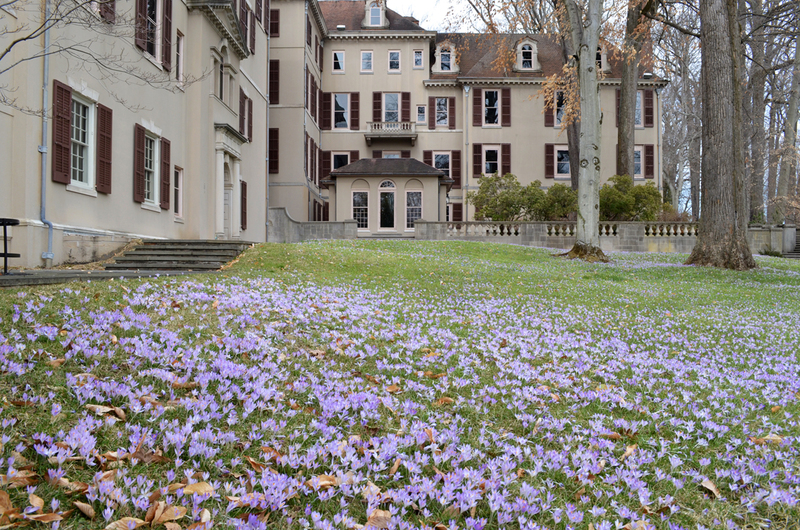 The house would become the Winterthur visitors know today only after Henry Francis inherited the estate in 1927. In May 1928, du Pont drafted architect Albert Ely Ives on a month-to-month retainer to prepare plans for an addition to the house that would more than double its size. Always actively involved in every aspect of the estate, du Pont closely oversaw the transformation from design to construction, even building his own construction shed on the site, where with his own set of plans, he would monitor the daily progress. 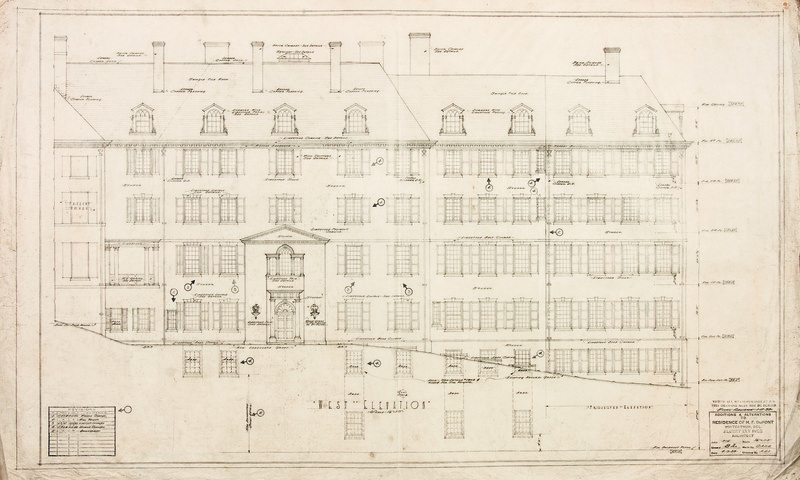 While summering in Southampton during the initial design stage, du Pont stayed in constant contact with Ives, writing long, detailed letters suggesting potential problems for the architect to review. In an eight-page letter dated September 18, 1928, du Pont questioned issues as how air would get into the attic, how the elevator mechanic would get to the machinery for repairs, why gutters were not shown on the design, even where the butler would put his ginger ale bottles. Winterthur was always du Pont’s pride, and he immersed himself deeply in the project to ensure every aspect was thoroughly thought out. I still live at Winterthur and my house is called that. The old house is now The Henry Francis du Pont Winterthur Museum, and I am happy to say I don’t miss it a bit. It is right there beside me and I naturally can wander around it at will and still get things for it. I have all the fun without the work. Showing people around was getting to be quite exhausting and I am delighted that I have actually seen it finished. This year Winterthur began another transformation inside and out! Renovations have been completed in phase one inside the house. Tinted glass or Plexiglas® was installed in the windows to filter damaging UV and visible light. This is an important and practical measure as light exposure can be damaging to collection pieces causing objects to fade, yellow, and become brittle. The former gray-tinted glass was replaced with a new bronze-colored glass that brings a warm, welcome glow to the house, restoring Winterthur to du Pont’s goal of maintaining the atmosphere of a gentleman’s private residence. Another advantage to the Plexiglas® is that the historic window frames are now visible from the exterior of the building. Before, the exterior windows appeared like black holes. The new windows create a more inviting outer appearance. On the outside, workers this week began encasing the house in ground-to-roofline scaffolding. The museum’s 410 windows, 15 doors, and approximately 800 shutters will be replaced to restore the iconic exterior of du Pont’s exquisite former home to architect Ives’s original 1930s vision. The exterior phase of the house renovation is scheduled to last until December 2014. Many facets of the exterior windows will be replaced including the deteriorating shutters. The wooden shutters will be changed to a composite material composed of fiberglass. Every effort was made to preserve the wooden window sashes and frames, a compromise to maintain the historical integrity of the house—though Winterthur’s mission is not that of an historic house but rather the preservation of the historic architecture contained within the home’s collection. Only three of the existing shutters are original to the home; the conservation department will preserve these shutters as they contain important historical information on paint color. The failing window frames will be repaired and restored from a pinkish paint to their original color, now known as Hazy Skies. Also part of the ongoing renovation, gutters, downspouts, and some chimneys will be fixed. And the maintenance and sealing of adjacent woodwork will end the intrusion of cold drafts, humid air, and damaging insects. 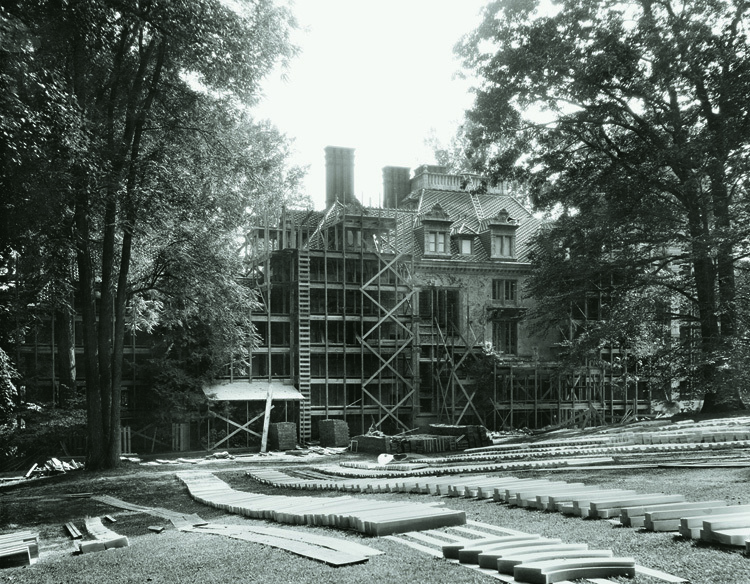 For ongoing updates on the progress of the house renovation, please visit renovation.winterthur.org. This entry was posted in Architecture, Behind-the-Scenes, Conservation, House and tagged Albert Ely Ives, Albert Ives, Chinese Parlor, Chinese wallpaper, Evelina du Pont, H. F. du Pont, Harry du Pont, Henry Algernon du Pont, Henry du Pont, Henry Francis du Pont, Hilary Seitz, Jacques Antoine Bidermann, Plexiglas, R G Architects, Visions of Grandeur, Winterthur, Winterthur Museum, Winterthur Museum Garden & Library, Winterthur Renovations, Winterthur Transformation, Winterthur Transformed. Bookmark the permalink. 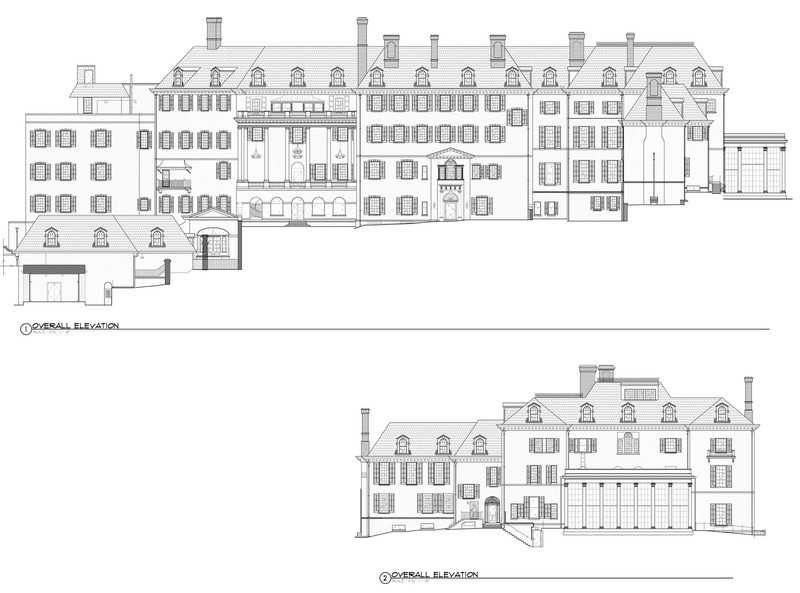 These are wonderful photos and architectural drawings of the Winterthur home of Henry Francis du Pont that my wife and I have visited well over a hundred (and probably many more) times in the past 40 years or so that we have been members. We know almost every room by heart. And it is wonderful to be assured that this ongoing renovation will preserve this marvelous home and its priceless collections for the enjoyment of many, many more generations of visitors to come after our inevitable last visit–which I hope will be quite a few more years to come. Your most recent reports on your web site concerning the renovation work are dated 7/22/2104 and 8/6/2014. Can you please bring them up to date. My wife and I had planned on visiting in May of 2014, but put off those plans because of the renovation work. If we visit in May of 2015 what can we expect to see form the exterior and how much of the interior will be accessible? Our apologies for the renovation website. 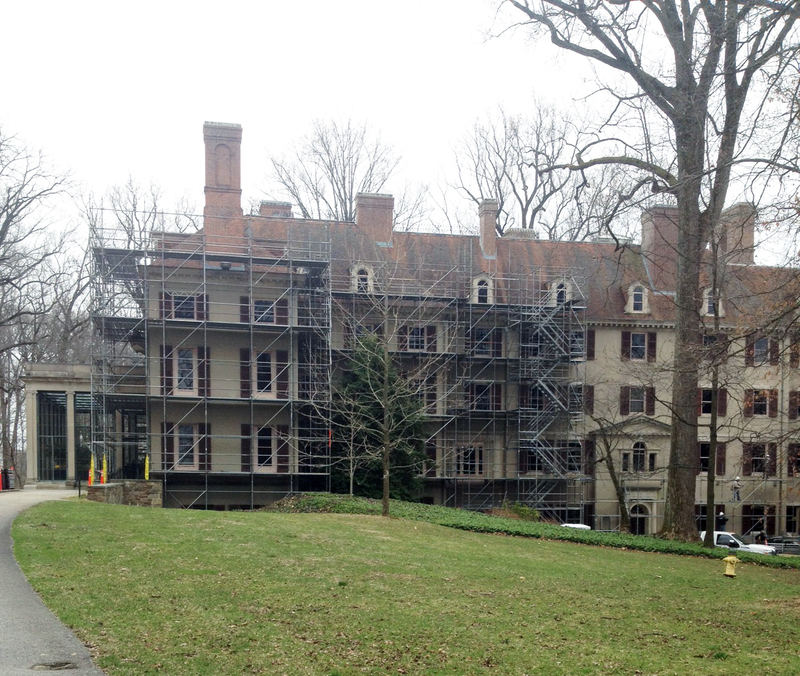 As of right now the renovation is continuing on schedule with the scaffolding and scrim set to come down during the time Winterthur is closed January 5–March 1, 2015. While the renovation work is a bit disruptive to the view of the exterior everything at Winterthur is open as normal during the renovation, house tours, narrated garden trams, including the Galleries which display our permanent collections as well as the exhibitions. If you are planning on visiting during May 2015 the renovation will be complete and the scaffolding will have come down around the exterior of the building at that time. Please let me know if you have any additional questions. Thank you!